I recently had the pleasure of talking to fellow novelist IJ Black about her Amnar series of books, her approach to writing and what she does when she isn’t sitting in front of the computer boldly creating new worlds. A hater of bios, the author apparently nevertheless “likes Chinese food, talking, and dancing. She drinks Lady Grey tea, probably too much”. I can also confirm that she is a good Twitter-pal and an all around good egg. 1 Tell us a little about Amnar. Amnar is an other-world fantasy, and the name refers to the place itself. It’s a vast, wild place that covers an entire planet, a global civilisation thrown into chaos by the collapse of one state into despotism. Amnar: The Inheritor is the first book in a series about one young woman caught between the state and the world around it. I suppose you could say it’s the place where Ursula leGuin, Philip Pullman and China Mieville meet. There’s a great deal of politics, a fair degree of violence, but also an insight into how people cope when life throws huge changes into their laps. 2 And your approach to publishing it? I have to admit I wasn’t convinced when I started writing it that anybody would be interested in reading it, let alone publishing it. Since then, I have had publishing deals with big corporate publishers, but none have worked out. I’d been posting things online for ages, thinking it would have no interest, but its built up a fan base so I thought I’d answer the call of readers and release the book myself through Amazon Kindle. 3 Have you been writing long? Yes, pretty much all my life. I think I wrote my first book when I was about ten. I’ve had a career in academia so writing is fundamental to that, and I’ve been writing pretty much solidly since then. I usually only count the books I’ve written since 2003, though. 4 How do you approach the process of planning and writing a novel? Do you outline in detail beforehand or just jump right in? I used to dive in with an idea in my head and see how it unfolds, but now I’m very much a planner. I use a spreadsheet approach, because Amnar books are complex and use multiple, interlacing viewpoints, so I have to know who does what and when. I find it much easier to plan, now, so if I do run into difficulties, I know what I’m supposed to do next. 5 You have a strong online presence, how important do you think it is for writers these days to interact with their audience and utilise social networking sites such as Twitter? I think it’s vital. I’ve recently heard from independent publishers that they still appreciate some authors want to keep a distance between themselves and their readership, but I think the more you’re able to be there, communicate with people, the better. It’s not just about people buying the books but helping to build a community around it, to share and develop ideas. 6 We all have writers – or particular books – that inspire and drive us on. Which book or author do you find has had the most significant impact on your wanting to be a writer? I don’t remember one author, but I was raised in an environment where books generally were adored and treated as special, and it just seemed natural to me to write. I read avidly from a very young age and it seemed almost natural, this wonderful thing that all these people could put their imaginary worlds onto the page. I read everything from Andre Norton, Anne MacCaffrey, JRR Tolkien, Ursula le Guin and David Eddings to Emile Zola, Franz Kafka and Dostoyevsky. 7 What are you reading at the moment? I’m actually in a non-fiction phase, and researching for Amnar, which hopefully explains it. I’m reading Kathleen Taylor’s Cruelty, a study of human cruelty and violent behaviour and why we do it. 8 When you’re not writing or reading, what other interests do you have? I’m a member of the Skeptics in the Pub movement, go to Greater Manchester Skeptics talks and run Skeplit, our book club, which runs monthly. I also love art, walks and if you follow me on Twitter, you’ll see that I spend a lot of time working out. I’ve been learning how to swim properly, as well as developing my general fitness and running regularly. It’s a great break from all the sitting still I do the rest of the time. 9) Finally – what are you working on now and what are your writing plans for the foreseeable future? At the moment I’m working on a background trilogy to The Inheritor series of books. I’m on the last one of those, and they’re released as a serial on my website three times a week. After that, I need to write the final draft of the follow up to The Inheritor, and the rest of those books. Amnar is so vast that it feels as though I’ll have enough to keep me going for the foreseeable future! 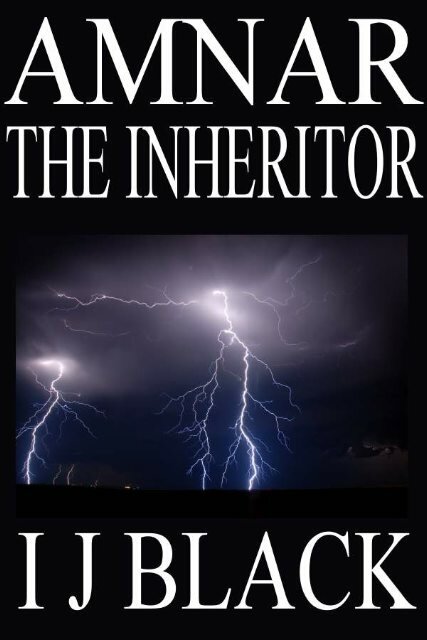 The Inheritor Amazon Kindle Edition Available Here. Also Available on Smashwords Here.